Motorcycle and moped accidents are more common than car accidents, but there's plenty you can do to protect yourself whilst travelling on two wheels when abroad. Hiring a motorcycle is a popular way to explore whilst on holiday, particularly in mainland Greece and the Greek islands. There has been a rise in the popularity of travelling by motorcycle on holiday to explore the local areas at leisure. Motorcycle hire firms often hire out a motorcycle soon after it has been returned from its previous outing, often with minimal safety checks in-between. To protect yourself, don't leave the premises without having tested the brakes and looking at the tyres. Ensure that the helmet is not damaged in any way as, if it has, it won't be an adequate source of protection. It is a good idea to ask to see the hire company's safety certificates to check that they comply with safety regulations for the country that you are visiting. The hire company should also demonstrate how to use the motorcycle safely. Different road conditions abroad, can make riding a motorcycle more challenging and dangerous than at home. Be sure to wear a helmet and protective clothing. Reflective or bright clothing will help you to be seen by other vehicles, especially in the dark or in bad weather. Padded clothing can help to soak up the impact of a crash and reduce subsequent damage to the body. Some protective clothing contains both hard and soft protection to reduce fractures and bruising. Leather protects best against the rough surface of the road. You should also wear boots and gloves to protect your feet and hands. Motorcycle riders aged under 17 are protected by helmet law in most US states, excluding Arkansas, Colorado, Idaho, Indiana, Iowa, Minnesota, Mississippi, Nebraska, North Dakota, South Carolina, Utah, Vermont and Wyoming . Motorcycle helmets are compulsory in built-up areas in most countries. 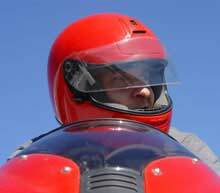 The use of a helmet is optional in the Czech Republic, Slovakia, Russia, Yugoslavia and Turkey when riding a 50cc moped, but is mandatory in all European countries in both built-up areas and non built-up areas - when riding a 125cc motorcycle. It is optional to wear a helmet when riding a sidecar in both built-up areas and non-built-up areas in Turkey and the United Kingdom. Make sure that you have the necessary insurance cover before you hire a motorcycle - it should cover you for dangerous sporting activities. Many insurance policies do not account for this, and you cannot claim it back on travel insurance. There are different types of motorcycle insurance, including liability coverage (covers bodily harm and property damage, but not you or your motorcycle), collision coverage (covers damage to your motorcycle), comprehensive coverage (covers outside circumstances such as vandalism and theft) and uninsured motorist coverage (covers you if the other party cannot cover the damage to your motorcycle). And finally, remember that just because you had a motorcycle 20 years ago it doesn't mean that your driving on two wheels is as good as it was way back then. Take it easy, drive carefully and remember that a motorcyle accident is generally far more serious than one in a car. Treat the motorcycle or moped with respect!